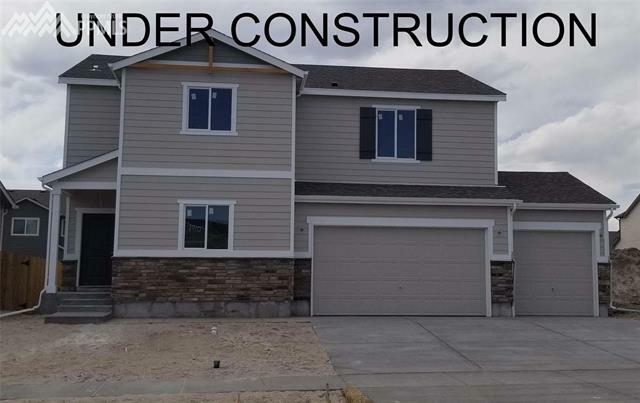 Brand new 5 bedroom home in Forest Meadows w/3 car garage. This home features a bedroom w/full bath on main level and an open concept layout from your kitchen to family room. Extended laminate floors from entry to family room, dining and kitchen. On the upper level you have a large master suite w/oversized walk in closet plus 3 secondary bedrooms and laundry. This home also has an unfinished basement with 9' ceilings and rough in plumbing. Exterior includes front yard landscaping. Large backyard and a nice view of Pikes Peak.